Survival and the Distributed Clone Factory. Metrix Create:Space is a unique place. It is one of the very first hackerspaces on the planet to try a straight-up commercial model. It is not a non-profit, it is not academically funded, the staff does not support the place on its hobby budget. This is our job. We survive by charging for our services. A lot of people have asked me how in the world this place can exist. We exist because you are awesome, and we want to help you make awesome things. We exist because I wanted to see if it was possible to build a sustainable hackerspace, legally, in the context of a city, in broad daylight. For the most part, this has been successful. We have been here for a little over a year, 12 hours a day, 7 days a week. We have expanded, we’ve tooled up, added more workshops and have tried to build up some inventory on parts. You have come here to hang out and meet others, get jobs, start unique businesses, and make awesome things. The flipside of that is we have tried to survive in a rough economy in the bright light of government and a dwindling emergency fund. We exist, but it is hard. Because we are a business, we can’t just ask you for money when things get hard. We aren’t funded, so we can’t go to our investors for more cash. We have to come up with something, implement it quickly and see if it works. We’ve seen Kickstarter work for people before, so we’re going to give it a shot with something we care deeply about. 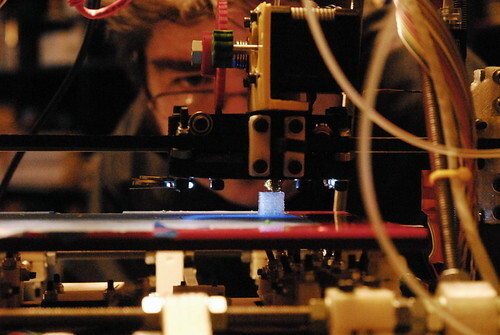 We want to put a 3D printer in every home. We believe that these tools in your hands will make the world better. We believe that the reprap project has the ability to do this, but only if properly bootstrapped. Makerbots and pre-printed Mendels aside, the best way to bootstrap anything is drive the cost down and push for local production. Open3DP has shown us a way with the Clonedel. We are in possession of a powder-based printer, a laser cutter, and the ability to execute an idea. We want you to help us build a distributed clone factory. We, with our powder printer will print the molds, keep up to date with Open3DP/Clonedel and distribute both parts and molds. You, as part of the Distributed Clone Factory will pour parts to make printers. We will remain transparent, so when you decide to start making molds with your powder printer, you will know what to do. $25, you get a 3D Buried Treasure (pickup only) and the chance to say you derailed the clone factory for an hour. $50, you get a set of clonedel plastic parts. You want to build a 3D printer? Cool. have at it. Printed parts are going on eBay for $150 right now. $250, you get one set of silicone molds. You can make clonedels all day long with this. Sell parts on eBay, or give them away to your friends. $500, you get one set of molds and a monthly mold diffs (if there are changes during that month) for one year. $5000, you get a full set of molds every month for a year.